Port Wing, Wisconsin native Megan Gustafson was taken by the Wings in the second round, with the 17th overall pick. Gustafson wrapped up an outstanding career at Iowa. Marquette’s Nitisha Hiedeman (Green Bay) was selected in the 2nd round, 18th overall by the Minnesota Lynx. 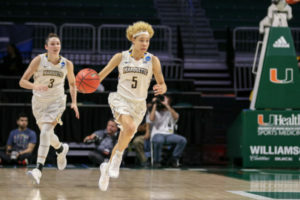 The Lynx quickly traded her draft rights to the Connecticut Sun. Hiedeman won Big East Conference Player of the Year honors last season and ranked third all-time at Marquette with 1,913 points.